TEAM™ EBSD Analysis System combines the ease of use of the TEAM™ software platform with the analytical power of OIM™ to provide state of the art crystal structure characterization to all users. TEAM™ EBSD is compatible with the market-leading Hikari XP EBSD Camera which offers an excellent blend of speed and sensitivity and the high resolution DigiView IV camera. 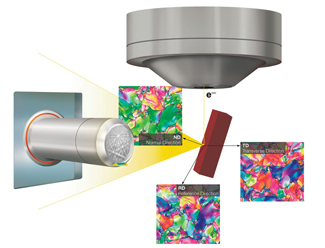 TEAM™ EBSD makes structural characterization easier than it has ever been, placing more solutions in the hands of users and proving that, once again, EDAX is the answer to challenging materials characterization needs.